Halloween is next week. Can you believe it?! 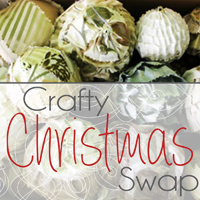 While you are getting all of your decor and costumes ready for the ghoulish event, don't forget to take a few moments and sign up for the Crafty Christmas Swap. It's a really simple, fun thing to do and will only take as much time as you would like it to. Basically, you will exchange ornaments with 3-4 other people from around the country or the globe. In light of the holiday next week, I made some simple paper bats to put up on the wall. I saw this done on as part of a decorated mantle and loved the idea, but thought I would bring some more color to the scheme. Print the bat template onto the back of your paper and cut the bats out. Use your scoring tool to score along the dotted lines. Place a ruler along one of the score lines and fold along the score. Repeat the previous step for the remaining score lines. Make two little eyes with your small hole punch, then just tape them to the wall! Hey all! Great news, I am part of another giveaway! This time, you could win a $100 giftcard to Amazon! Click on the photo below to enter! A few years back, a friend gave me her small stash of yarn as sh didn't figure she would use it. Within the skeins was this fuzzy black yarn that I didn't really care for. It has been kicking around the bottom of my large plastic tote this whole time without an evident purpose. Well, at the beginning of this month I saw it and thought, "What the heck, I will make a quick bonnet from this and hope for the best." When I finish it, I actually really liked the little hat, so I thought I would add it to my list of free knit patterns. Enjoy! I only did one size for this bonnet, however, it is REALLY stretchy and could probably fit anywhere from a 1-year-old up to a small 3-year-old. It is knit flat from the front to the back then folded in half and sewn together on one side. It is a VERY easy pattern and I would recommend it for beginners. Knit every row until piece measures 3.5"
Bind off leaving a long enough tail to sew the two sides together. Your piece should measure approximately 14" x 5 1/2"
Bind off, leaving a long enough tail to sew the ear to the hat. Fold your hat in half so that the shorter ends are together and sew along the bind off side. Position and attach each ear. Cut 6 pieces of yarn twice the length you would like the braids to be. Fold three of the pieces in half. Pull the loop at the half of these three strands through one corner of the hat, then pull the loose ends of these same three pieces through the loop and pull tight. Braid the three (now six) strands and tie a knot at the bottom. Repeat on the other corner with the remaining three lengths of yarn. I thought I would let you all know that I have made some changes in the shop recently. I have started taking custom orders for my Fancy Spats. I have also added some new baby items. Just so ya know, all of the items in my Etsy Shop are completed pieces and not patterns. Ravelry is where you will find all of my knit and crochet patterns. Click on the photo below to check out the changes on Etsy! Here is a sweet cake I made for my daughter. I have seen stenciling all over Pinterest and thought I would give it a try. Turns out, it is immensely easy. So, here are the few steps. Ok, to start out with, determine what you want to stencil and print it out at the size you want it to be. I did a 2 in Poor Richard font, which came with my computer. For scissors, trace the picture onto the wax paper and cut it out. For a craft knife, tape the image to the mat, then tape the wax paper on top. Carefully cut the image out. Now, gently place the wax paper onto the frosted cake and carefully push down and corners that roll up. Cover the cut out in sprinkles, brush away the excess sprinkles and carefully lift off the wax paper. Use a tooth pick to remove any stray sprinkles and smooth out areas of the cake that were tampered by the wax paper. A couple weeks ago, while driving to my sister-in-law's house, I noticed piles of "trash" on the curb in front of many of the houses. Most of the mounds were branches from trimmed trees and bushes, but as I kept driving, I passed one heap with two pallets on top of it. I didn't get too far before turning the car around and loading up the pallets into my trunk. I had a few ideas in mind of what I could use these treasures for, but what I eventually landed on was a growth chart. For the last six months or so, I have had this project in the back of my mind. I have seen so many darling versions all over Etsy and Pinterest, but I really didn't want to go out an buy any supplies as my budget is basically nothing. So, that weekend, my loving husband helped me pull the pallets apart and cut them in to pieces so I could make the sweet creation in the picture below. Begin by breaking apart the pallets using your hammer to pry up the boards. It may be helpful to take a second hammer and pound the first to get it wedged under the board better. Remove the nails. I used the marks created by weathering to figure out the width and cut one board, then used that board to mark the rest. Sand down the front and sides of your cut boards. Line up your pallet boards in the order you would like them to be, right side up, then flip the boards over and place each 1 x 1 1/2" board about 2" - 3" from the side and nail them to each board (I used 2 nails on each side for each pallet board). Wipe down your chart so that there is no sawdust left behind and let it dry. Now comes the fun part; deciding what image to paint on your chart. I wanted mine to be gender neutral and I didn't want anything too juvenile so that it could hang in a more visible place then the bedroom some day. I modified an image I found online, then, to transfer the image to my chart, I remembered a technique I learned in 4th grade. The chart is basically broken down into 16 segments vertically (as in there are 16 pallet boards), so I segmented my image into 16 slices and used that to redraw the picture. For the ruler part, print this template on card stock to use as a stencil (the rectangle on the bottom left is to help place the letters). Periodically check the measurements as you are tracing the tick marks to make sure they are in the right place. Here are the numbers: 23 45 6. Cut each number, making a straight edge along the left side of the digit. Then, using a pencil, color the back of the page. Position the number on the chart, using the rectangle from the stencil. Trace the number with the pencil and when you remove the page, there should be a number transferred onto the wood. Paint your image and your ruler marks with the acrylic paint. Once the paint has dried, go over the surface with your fine grit sandpaper, being careful not to remove too much paint, and follow the directions on the can to apply the polycrylic. Use the picture hanging kit to hang the chart on the wall.